A new and improved version of freqVectorsEdit.sh is now available. This update is required for XCPM for unsupported Processor so make sure to use this update or you will end up with the: “X86PlatformShim::start – Failed to send stepper” error. Note: What this update does that the previous versions didn’t do is that it checks for the FrequencyVectors array, and it will add it when it is missing. This error was a left over from the past, when Apple changed the FrequencyVectors dictionary into an array. Something that slipped off my radar and never got fixed. Should be fine now. Please confirm. Thanks! This update is required for XCPM for unsupported Processor so make sure to use this update or you will end up with the: X86PlatformShim: failed to register pstepper error; what was the exact text again? Edit: The text of the error is: “X86PlatformShim::start – Failed to send stepper” error. Thanks to cecekpawon for sharing it. The lack of XCPM support for my new Broadwell E processors was a bit frustrating and thus I had to do something about it. And I guess that most of you know me by now so it was just a matter of time. As in. Consider it done! Right. I can boot macOS Sierra and I see IOPPF: XCPM mode along with XCPM registered. That is pretty cool. In fact. This is amazing. Let’s go check some stuff. sysctl -n machdep.xcpm.mode returns 1 so that is fine. Also. Running kextstat shows me that both AppleIntelCPUPowerManagement.kext and NullCPUPowerManagement.kext are missing in the list with loaded kexts. Great. 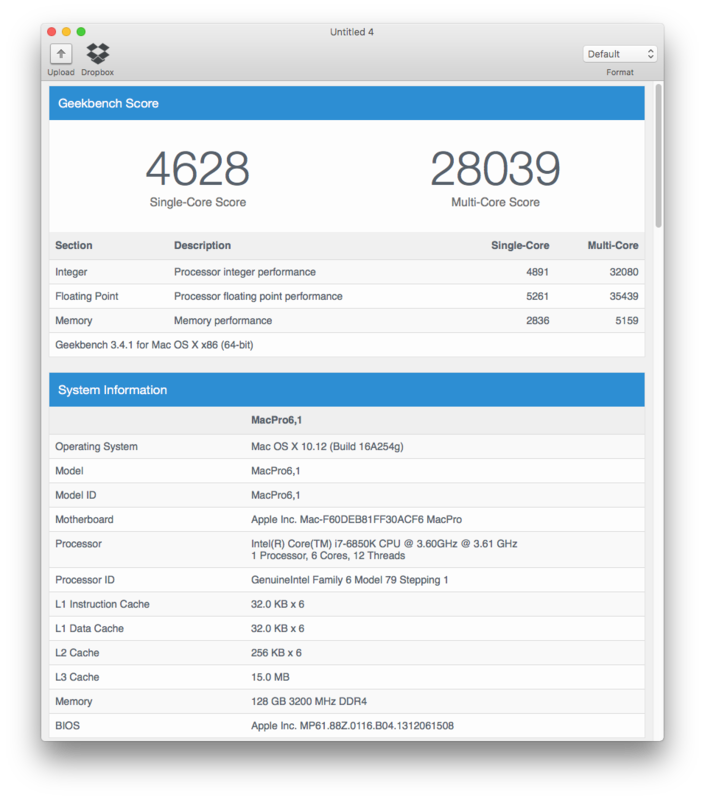 Now a Geekbench v3.4.1 top score – one of four runs – of the Intel i7-6850K. I must admit. The longer I use this processor the more I get impressed by it. Who would have thought that? And let’s not forget. This is with XCPM so it is the more impressive. In fact. People with an old i7-5930K may keep it. Hmm. C3 is missing. Seems like I forgot to enable C3 for Broadwell E processors and thus I have to fix this and re-compile the kext. On a second thought. The redirection bits are not set in MSR 0xE2 so this is expected result. But both MSR_PKG_C2_RESIDENCY and MSR_PKG_C6_RESIDENCY are non-zero. A sweet spot. Update: I don’t have a lot of time, but I also do not want to let you wait so here you have it! // kernel location 0x220b30 and 0x220b5f in _xcpm_idle from 0x0f30 (wrmsr) to 0x9090 (nop nop). // kernel location 0x22a820 change 0x55 into 0xC3 (ret) to stop the KP. Update: DP4 is now available and the byte patterns are still the same, but the locations have changed to: 0x1f8d81, 0x227d32, 0x21e440, 0x21e46f and 0x228130 (same order as above). Update-2: DP5 is now available and the byte patterns are still the same, but the locations have changed to: 0x1f8930, 0x228af0, 0x21eff0, 0x21f01f and 0x228f50 (same order as above). Update-3: DP6 is now available and the byte patterns are still the same, but the locations have changed to: 0x1f7cc0, 0x227f30, 0x21e430, 0x21e45f and 0x428390 (same order as above). Update-4: DP7 is now available and the byte patterns are still the same, but the locations have changed to: 0x1f8d71, 0x227fc2, 0x21e460, 0x21e48f and 0x2283c0 (same order as above). The patches can be done in at least three different ways and I picked what I think is the easiest one to understand. So I hope. Also. I don’t use FakeCPUID – nor Clover for that matter – with my patches, but some people using Clover reported a hang. For them it won’t boot without FakeCPUID (thanks to giacomoleopardo for the update). 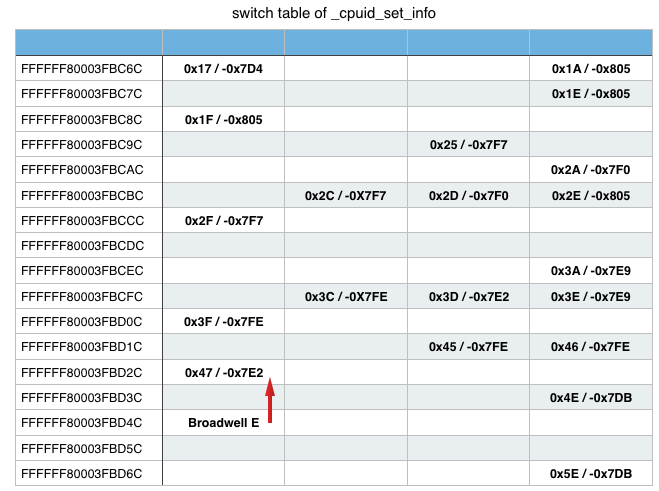 The offset for the Broadwell E processor is missing in this table. 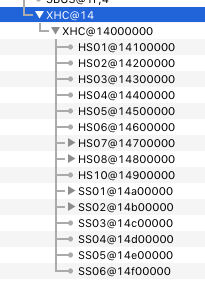 There is an address but that jumps to a location for unsupported processors, which is why we need a patch for the Broadwell E processor (the red arrow shows you what we do with the patch) but I think that Apple will fix this with a future update of macOS Sierra so that we also no longer need to patch the table for Broadwell E processors. This time the table starts at 0x3c instead of 0x17 and there are no addresses for the Ivy Bridge E, Haswell E and Broadwell E processors, again, for the same reason; it jumps to a location for processors that do not support XCPM. This routine has no matching case number for the Ivy Bridge E, Haswell E and Broadwell E processors. That is why we lower the model number to make it match with a supported processors model. Like we are using a normal Ivy Bridge, Haswell or Broadwell processor. A simple but effective trick it seems. I hope that my explanation about all this helps you to understand what we are doing. Edit: Make sure that you either use a SMBIOS model/board-id with FrequencyVectors data in its plist, or patch it with help of freqVectorsEdit.sh v2.3. 1.) The X86PlatformPlugin.kext will only load with the plugin-type property is set on the first logical CPU. This however is not enough to enable XCPM mode. No. You may still use AppleIntelCPUPowerManagement.kext Even when X86PlatformShim.kext is loaded. 2.) The FrequencyVectors data in the plist is used to configure power management, and is not the same for all models/board-ids. Please use one that works for your setup. 3.) If sysctl -n machdep.xcpm.vectors_loaded_count returns 0 then the FrequencyVectors data is not being used. Backup the plist for your board-id and replace it with a different plist. 4.) If you use ssdtPRGen.sh to generate your ssdt_pr.aml then make sure to use the -turbo [top-turbo-frequency] argument for overclocked setups. 5.) Check for XCPM related errors at boot time. Like this: X86PlatformShim::start – Failed to send stepper. You got to fix errors or things may not work properly. 1.) Fix LFM frequency (fixed to 800MHz). 2.) Figure out what MSRs trigger a reboot and only block them. Not all other supported MSRs as well. Yesterday I blogged about my Intel i7-6800K Geekbench results and I said to replace the i7-6800K with the i7-6850K to see what that brings. Well. It’s not just the higher clock rate (3.6GHz versus 3.4GHz) but also the maximum turbo frequency (4GHz versus 3.8GHz) and some headroom for 200MHz extra OC. Where is the Geekbench 3.4.1 result? Right. Here it is. Enjoy. Edit: I forgot to tell you something. I did not need VoodooTSCSync.kext with the i7-6800K and I also don’t need it with the i7-6850K so that is good news. And there is another bug in the 601 BIOS. At least that’s how I see it. This one blocks me from enabling the C3 and C6 C-states – options are greyed out and MSR(0xE2) is missing the bits. The problem appears to be the CPU Ratio setting in the BIOS, since changing it from Auto to anything else (Sync All Cores or Per Core) basically disables the C-States setting. Ok. I found a workaround for it, after fiddling with the CPU Core Ratio setting, but I love to see a real fix for it. Perhaps in the next BIOS update? One that doesn’t set the lock bit of said MSR? On a side note. Why do I keep seeing the error that tells me that over clocking failed… and I have to press F1, when in fact I didn’t even – at that time – OC my rig? p.s. The i7-6800K is not a typo. Yes. I also have a i7-6850K waiting for this motherboard, and we will install it (again) sometime next week. I have an Asus X99-E (WS) motherboard for testing laying around, for ages, that I like to use with Broadwell-E processors (i7-6800K and i7-6850K) and I’d like to use this setup for power management testing, but the guy who is installing the hardware said that it reboots when the kernel should be launched. Please be aware that we don’t use Clover… so we can only use raw patch data. Update: I went to the shop this morning and checked the setup myself and found two major errors. 1.) Error in com.apple.Boot.plist; “Boot Graphics” was used like it was “Graphics Mode” (triggers a reboot). 2.) Error in the BIOS; -> CPU Configuration -> Enable Execution Bit was set to ‘Disabled’ and that is known to trigger a reboot. Update-2: We disabled the XHCI controller in the BIOS (the AsMedia 3.1 USB controller was already disabled) and now we are seeing this: “Still waiting for root device” error. One step closer, but USB is acting up. Handoff is enabled in the BIOs so that should not be a problem, right? We had this setting on Enabled and changing it to Disabled solved the errors. The macOS Sierra installation process is now running done and everything looks alright. 2.) Slow 3.4 GHz base frequency. 3.) Limited turbo support (only 200 MHz extra). 4.) MS Windows only ‘Turbo Boost Max 3 Technology’. The Intel Turbo Boost Max 3 Technology is mind boggling limited and has no future. It only adds a new layer of complexity. We don’t need that. Your processors should deliver the best performance, on request, without the need of (MS Windows only) driver(s). Update-5: I ran AppleIntelinfo.kext (the KP was fixed in the latest update) and what we see here is that while MSR_TURBO_RATIO_LIMIT (0x1AD) is setup correctly by the BIOS (0x2323232425262728) bit only really triggers the first turbo frequency. This was with a mild manual OC to 4.0 GHz. And even then only 3.5 GHz was reported, and 4.0 GHz only once. Another error is that the IA32_ENERGY_PERF_BIAS MSR (0x1B0) is zero – this value should be at least 1 and not be higher than 15. At least for XCPM mode. This value can, in theory, enable up to 32 USB ports since the bits are linked to physical ports (USB 2.0 and USB 3.0 on the same port share one and the same bit). My GA-B150M-D3H (DDR4) motherboard has ten USB 2.0 (HSnn) ports and six USB 3.0 (SSnn) ports. Giving me a total of sixteen ports. We also know that there is a limit of fifteen ports, so I had one too many, but I don’t use one of the headers on the motherboard and thus I have fifteen active ports. In short. I don’t need a port limit patch. In fact. This kind of code snippets is used for all USB ports. The mask value is different for each port. The two sub-routines (GUPC and GPLD) are used to prevent code duplication. In short. Method _UPS returns Return (GUPC (One)) for active/enabled ports and Return (GUPC (Zero)) for inactive/disabled ports. or use a one liner to set the value. To me the most simple solution there is.